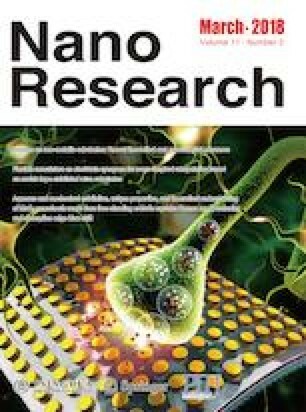 This paper presents a wafer-level and highly controllable fabrication technology for silicon nanowire field-effect transistor (SiNW-FET arrays) on (111) silicon-on-insulator (SOI) wafers. Herein, 3,000 SiNW FET array devices were designed and fabricated on 4-inch wafers with a rate of fine variety of more than 90% and a dimension deviation of the SiNWs of less than ± 20 nm in each array. 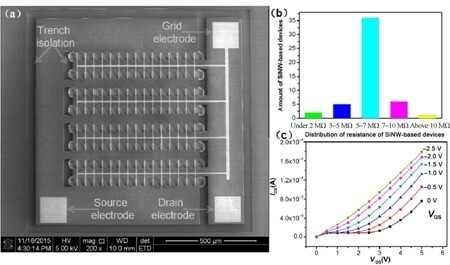 As such, wafer-level and highly controllable fabricated SiNW FET arrays were realized. These arrays showed excellent electrical properties and highly sensitive determination of pH values and nitrogen dioxide. The high-performance of the SiNW FET array devices in liquid and gaseous environments can enable the detection under a wide range of conditions. This fabrication technology can lay the foundation for the large-scale application of SiNWs. Supplementary material (the SEM image of single SiNW-FET, the SEM image of SiNW array, and the local amplification figure) is available in the online version of this article at https://doi.org/10.1007/s12274-017-1768-z. We appreciate financial support from the National Key Research and Development Program of China (No. 2017YFA0207103), Project of National Natural Science Foundation of China (Nos. 91323304, 81402468, 61327811, and 91623106), Shanghai Youth Science and Technology Talent Sailing project (No. 14YF1407200), Project for Shanghai Outstanding Academic leaders (No. 15XD1504300) and Youth Innovation Promotion Association, CAS.